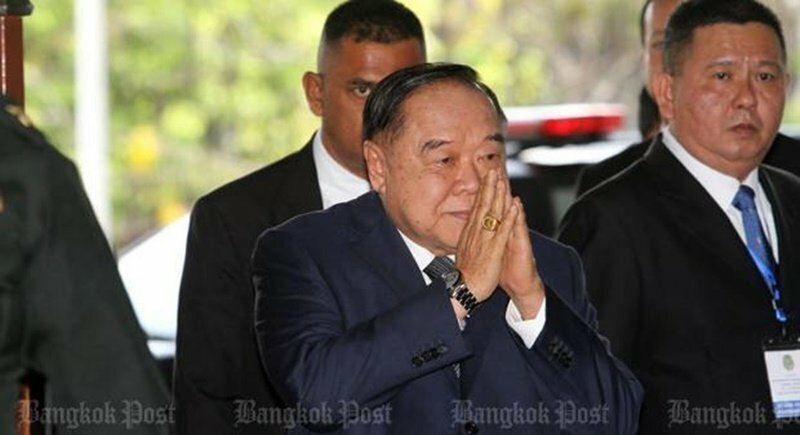 BANGKOK: Having kept quiet during the luxury watch controversy for months, Deputy Prime Minister Prawit Wongsuwon yesterday (Apr 1) broke his silence to insist the whole affair was designed to attack Prime Minister Prayut Chan-o-cha. Gen Prawit is suspected of dodging a law by not declaring all his assets to the National Anti-Corruption Commission (NACC) after being spotted wearing 22 expensive watches and a diamond ring. While the NACC is probing the allegation, the deputy prime minister, in a rare interview on the case, claimed yesterday that an “opposite side” may be using him as part of a political attack on the prime minister. His remarks come as Gen Prayut is under criticism for trying to prolong his power, with help from Gen Prawit, after a general election that is expected to take place in February next year. Few politicians or democracy advocates are keen on the idea. The deputy prime minister yesterday reiterated that all the watches were borrowed from his best friend whom he had known since their school days at St Gabriel’s College. He was speaking of billionaire Pattawat Suksingwong who died early last year. The late businessman was an avid collector of more than 200 watches and some were lent to him, according to Gen Prawit. “Pattawat was very rich. He had given me his watches for more than 20 years. When I got bored with one, I returned it to him and he gave me new one,” Gen Prawit said. Such a routine proceeded for a long time before the controversy erupted. Gen Prawit was first seen in public wearing a Richard Mille watch, worth millions of baht, and a diamond ring when he raised his hand to shield his face from the sun during a cabinet photo session last December. “I’m not stupid,” Gen Prawit said. “I’ve worked as a minister for many terms. Why don’t I know about the asset declarations?” he asked, while admitting he should have clarified things sooner. He broke silence because he already knows the 'verdict' of NACC, that will become public later. Of course NACC = Pom Prawit. Pronouncing yourself a victim, oh Lord.